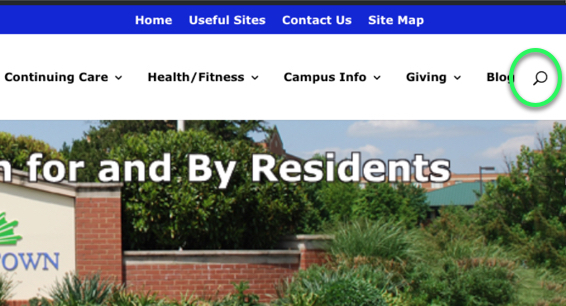 The magnifying glass on the top menu of the Charlestown Resident Website page is a Search icon, and if you click it, you will be able to type in a word or phrase to find what you are looking for. You can also search by filling in a term at the bottom of the front page on our Search Bar. It searches exactly the same way as the link to the magnifying glass. Keep in mind that the search icon does not search the internal content of a PDF, and so you cannot look up “chocolate cake” to find which restaurant has it. If you do not find something on the website, and you think that it should be there, send us a note on the Contact Form. We may have used a different term for the concept, or the item might be missing from the website. In either case we want to learn about it.